Police are searching an Islamic school in East Sussex and 17 residential properties across London as part of an ongoing anti-terror investigation. Officers are also continuing to question 14 men arrested in London. Twelve of the arrests - on suspicion of the commission, preparation or instigation of acts of terrorism - came at a Chinese restaurant in Borough. Scotland Yard said the arrests were not connected to the alleged transatlantic jet bomb plot or the 7 July attacks. 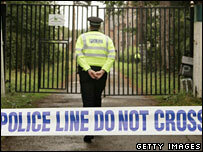 The men are being held at London's high-security Paddington Green police station. As well as the Jameah Islameah Islamic school at Mark Cross, near Crowborough, officers have been searching residential properties in north, south and east London. Sussex Police said searches at the school could take weeks but no arrests had been made there. 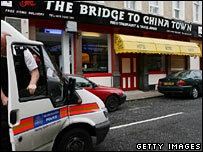 The restaurant raided was the halal The Bridge to China Town, in the Borough area of south London. Home Secretary John Reid is said to have been kept fully informed about the raids. The BBC's Keith Doyle said they came after "months of surveillance into those suspected of recruiting or encouraging others to take part in terrorist activities". Dr Muhammed Mukadam, the Chair of the Association of Muslim Schools in the UK, told BBC Five Live that the school was causing him "concern". He said: "It is a school that is of concern to all. "First of all it hasn't been registered by Ofsted and therefore technically speaking it shouldn't be operating as a school at all." In a separate operation two men were arrested in anti-terror raids in Manchester. The pair were detained under the Terrorism Act and three addresses in the Cheetham Hill area were searched.